Librarians develop myths to explain themselves to society and to generate support for their profession. Since the last quarter of the 19th century, the prevailing myth has been the myth of the library as place. Confronted with social change, librarians are searching for a new myth. They are abandoning the myth of the library as place and are adopting uncritically the assumptions and values of the myth of the electronic library, with profound consequences for the future of librarianship. 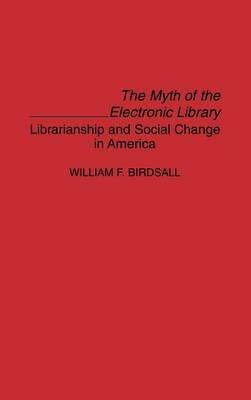 This book examines the assumptions and values of the myth of the electronic library, compares them with the myth of the library as place, and explores the meaning of the library as a place, alternatives to the information society, the role of the librarian in a therapeutic society, and the politics of librarianship. It concludes with a set of propositions with the objective of encouraging librarians to assess critically the role of libraries and librarianship in the context of social change and, especially, to debate more fully the implications of the myth of the electronic library for librarians and the users of the library.